Located in the State of Karnataka in India, Chitradurga lies by the side of the river Vedavati. 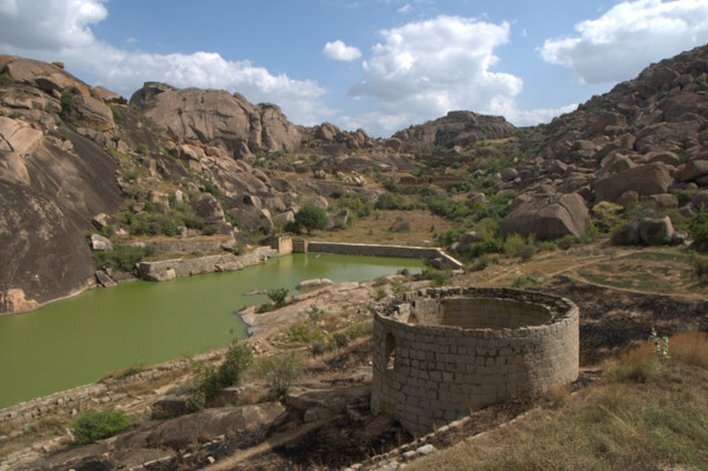 This place is also the headquarters of the district of Chitradurga and lies at a distance of 200 kilometers from Bengaluru and was named after an umbrella-shaped hill found here. This place was known by several names like Chitrakaladurg, Chitradurg and the British named it as Chittaldrug. Covered in hills, valleys and rivers this is a picture perfect place and the beauty of nature attracts tourist from all over the globe. This town is also known for its stone fortresses. The Chitradurga Fort built during the 17th and 18th century have gone through the hands of several rulers and undergone the transformation. But the fort was expanded during the rule of Hyder Ali and Tipu Sultan. Within the fort are temples, masjid, storage for oil and grain and a citadel. Being a place of Historical importance this fort is quite popular among tourists. The Hidimbeshwar temple situated within the fort is the oldest among the 20 temples and a 'must see' place. The temple is carved out of a rock and has the influence of the Dravidian culture. The Vani Vilas Sagar dam located at a distance of 32 kilometers from Chitradurga is also worth seeing. The best time to visit this place is from October to March. Learn more about Chitradurga here. Chitradurga is popular for its stone forts and temples and picturesque beauty. Find out about sightseeing, temples and how to reach Chitradurga. Bheemasamudra Dam is constructed across the river Jinigi Halla. The dam derives its name from the name of the village where it is located, Bheemasamudra village. Read on to know nearby sightseeing and accommodation options. Of the eighteen temples in the Chitradurga fort, the most prominent is the Hidimbeshwara temple. It is associated with an incident in the Mahabharata. <!– –> The government has decided to setup a science city in Chitradurga, near Bangalore.